Estos monstruos son imanes para la nevera. Llevaros a los niños a la playa o al campo a coger piedras y manos a la obra. Como veréis en el DIY de Coastal, son muy fáciles de hacer. 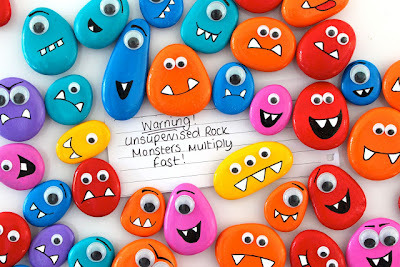 These monsters are refrigerator magnets. Take the children to the beach or to the countryside to get come stones and go to work. As you will see on Coastal's DIY, they are very easy to make. Una caja de cartón se puede convertir en una casita. Los pasos en She Knows Parenting. 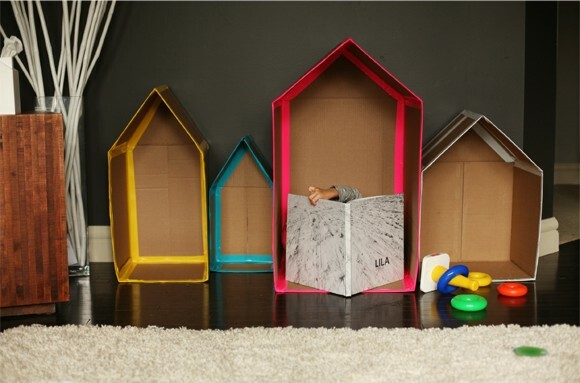 A cardboard box can turn into a little house. The steps on She Knows Parenting. Esta mañana desde la terraza oíamos piar a los pájaros y parecían competir por cual cantaba mejor. Si queréis disfrutar de sus cantos podéis atraerlos con estos adornos hechos con gelatina y alpiste. La idea es de Eigtheen25. This morning, from our terrace, we could hear the birds twetting. They seemed to compete for seeing which of them was the best singer. 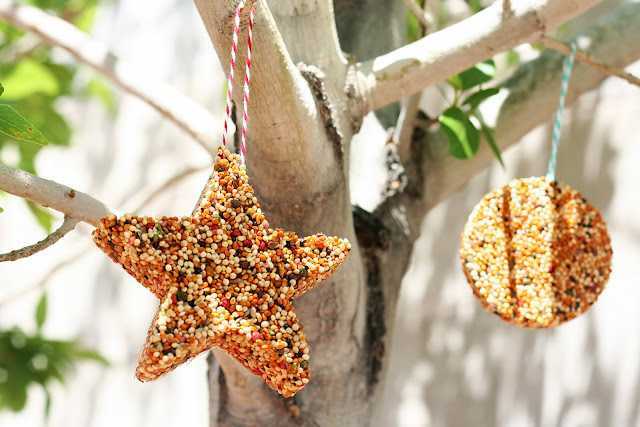 If you want to enjoy their singings you can attract them with these ornaments made with gelatine and birdseed. Eigtheen25 had the idea. Estas mariposas de papel seguro que resultan una manualidad muy divertida para los peques. 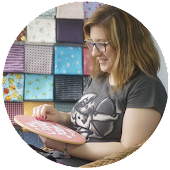 El tutorial es de Make it Love it. 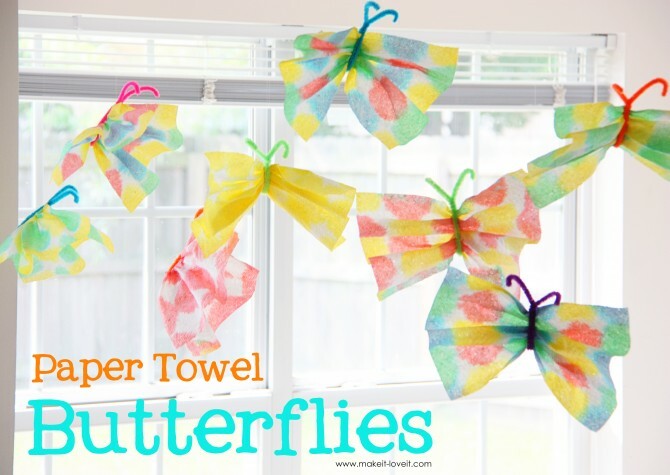 Sure that these paper butterflies result a very enoyable craft for children. The tutorial is by Make it Love it. 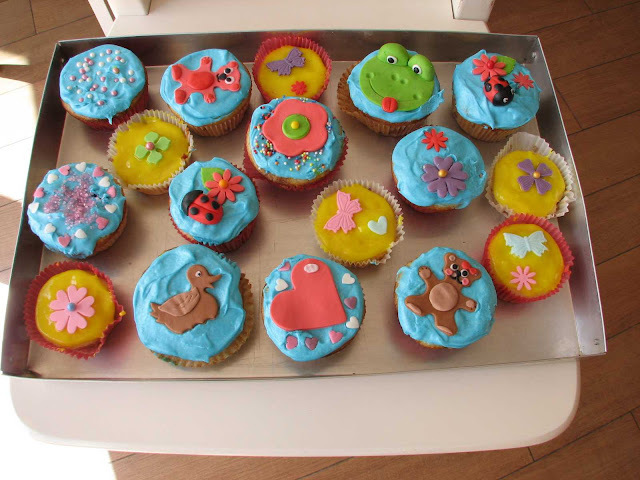 Las vacaciones son la mejor época para cocinar con los niños, ya que tenemos tiempo para dedicarles... y para limpiar. Lo mejor es comenzar por cosas sencillas que les diviertan, como estas rebanadas de Sugar & Cloth. The vacations are the best time of year to cook with children, as we have time for them ... and for cleaning. 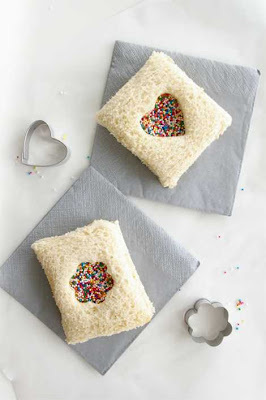 Best is to start with simple things they can enjoy, as these bread slices from Sugar & Cloth.